Gold prices added over 1% ahead of the ECB rate-setting meeting this morning as the post US jobs data-sparked Friday rally continued to unfold. Yesterday was characterized as a non-event in the market as prices meandered in a very tight price range. Still, market observers feel that the pros are not yet in the game and that their presence is essential for an extension of the move to beyond $1,640 and certainly $1,680 per ounce. The latest roundup of New York spot prices showed gold gaining $17 at $1,634 per ounce, silver ahead by 86 cents at $29.39. The big mover thus far today was platinum; it jumped by 1.8% to $1,460 per ounce. The gold market’s net speculative length is at or very near multi-year lows. Hedge funds and money managers have reduced their net-long positions (i.e. bets for higher prices) in the yellow metal by 70% since August of last year, to a level almost as low as the market contained back in December of 2008. Gold-based ETFs have seen their balances shrink for a third month in May and the cumulative value of same is now ~ $17 billion lower than back in August. Open interest in gold fell to just over 420,000 contracts outstanding from nearly 651,000 in November of 2011 and a near one-and-a-half-year low of about 18 million ounces of gold was cleared through London in April. Meanwhile, on the physical side of the market, Indian gold consumers — perhaps the world’s most price conscious (at both ends of the value spectrum) — have turned into aggressive… sellers of the yellow metal in recent days. Scrap gold spigots have been turned to "full flow" in the wake of record high local prices and, according to Mr. Bachhraj Bamalwa, Chairman of the All India Gems & Jewellery Trade Federation,"In some areas [of the country] consumers are selling more than jewelers." 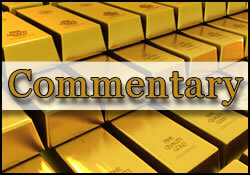 Another bullion firm official noted that "Physical buying is not there, because prices are very high. Everybody is selling, even retail investors, who had invested at lower levels, are sellers right now. "According to the latest Standard Bank (SA) report "There is another potential weakening of physical support in the coming months. Seasonally, we are entering a period of weaker physical demand, especially out of India during the upcoming monsoon season." So, here we have, again, a repeat of the situation in January/February: weak supply/demand fundamentals but a rising (based on speculation) gold price. Lather, rinse, repeat. Market players who had hoped that the ECB would finally cave to external pressures resulting from the troubles in the eurozone were left disappointed this morning when the institution left interest rates as they were. Money markets had priced in a partial rate cut and equity and commodity markets had also perked up overnight in anticipation of same. Still, observers will keep… observing the ECB’s Mr. Draghi for more than just the criticism he so liberally doled out last week at the region’s politicians when he pleaded with them for a banking union. In the interim, ratings agencies have been competing with each other in liberally handing out more downgrades and borrowing costs for certain troubled nations have once again been approaching critical levels. Spain has warned that it is effectively being shut out of the bond market. The country’s government is getting ready to pump 10 billion euros into already-nationalized lender Bankia. The G-7 meeting held yesterday yielded an agreement to respond in a coordinated fashion to the region’s crisis, but little else of substance. Thus, markets kept up the selling pressure on the euro on Tuesday and speculators are treating the $1.25 level as a good point at which to pull out. IMF Chief Christine Lagarde had said two days ago that she felt that the ECB had some room to maneuver but apparently ECB team members apparently prefer to wait for more in terms of negative econometric signs before they pull the accommodation trigger. Curiously, they did not seem to weigh the 2.2% contraction in German industrial production in April as one of those signs. On the other hand, Germany itself is now apparently leaving a small crack open in the door towards fiscal union. Chancellor Merkel hinted at tighter cooperation on the banking front when she said that systemic banks may "need supervision at the European level." "Because the election polls suggest a dead heat (in Greece), the market is not going to want to go into it with record short euro positions." Brown Bros. Harriman currency strategy head Marc Chandler still suggested a target value zone for the euro, in due course, at near the $1.17 level. As for Greece, apparently China is taking certain precautions and is drafting contingency plan "G" as in: Grexit. There have been unconfirmed reports of certain British banknote printers getting ready to roll out colorful little rectangles featuring dolphins and temples along with the word "drachma." Over in the USA, after the big event that Friday’s Labor Department data engendered, the tone has calmed down somewhat. However, the hot/cold data sets keep coming and are keeping markets guessing as to what the Fed might/might not do when it meets on the 20th of the month. Yesterday it was noted that the ISM’s services sector index for May rose to 53.7% from April’s 53.5%. Today we learned that US worker productivity declined more than had been anticipated in Q1. The above — as has become "normal" by now is resulting in once again conflicting statements being made by various Fed officials. Atlanta Fed President Dennis Lockhart said that under certain circumstances "further monetary actions to support the recovery will certainly need to be considered." Mr. Lockhart’s teammate, St. Louis Fed President James Bullard however feels that last Friday’s jobs report — albeit disappointing — does not substantially alter the contours of the US economic outlook. Mr. Bullard cautioned that shifting FOMC monetary policy at this juncture would not change what is taking place in Europe. "the Fed should not be an “accomplice to the mischief” of fiscal policymakers in Washington who have not done enough to support the stumbling economic recovery." Mr. Fisher had previously expressed a healthy dose of skepticism regarding the efficacy of OT (Operation Twist). He believes that "short of an [economic] implosion" he cannot support further QE. Separately, Cleveland Fed President Sandra Pianalto said two days ago that even with Friday’s feeble jobs creation readings there is little to warrant further easing in the Fed’s monetary policy. These types of statements are worth well noting as we once again remind loyal readers that much — too much — in the way of speculative hope in commodities has been piled up based singularly on the expectation that the Fed will undoubtedly offer more and more forever and ever more. An excellent, Star Wars-flavored explanation of the Fed and of its monetary actions has just been posted by Atlantic associate editor Matthew O’Brien. In his "Save Us, Ben Bernanke, You’re Our Only Hope" Mr. O’Brien explains where the Fed’s money comes from, where it goes, and what to expect in terms of inflation and/or deflation plus a host of other related metrics. Lots of people don’t like this. They worry that this increasing pile of reserves will mean increasing inflation when banks eventually lend them out. Or that this is really just another backdoor bank bailout. Or that this shows that quantitative easing doesn’t work. Let’s consider these in turn. First, the Fed has a number of tools to prevent excess reserves from being lent out too quickly. It’s actually using one right now, although it really shouldn’t be. It pays interest on these reserves. That’s right: It pays banks not to lend." "So relax," says Mr. O’Brien. "Zimbabwe is not in our future. Second, the Fed doesn’t give banks this money for free. The banks give up bonds in return. It’s swapping one asset for another. And third, just because so many reserves aren’t lent out doesn’t mean that quantitative easing accomplishes nothing. If nothing else, it signals that the Fed will not passively watch inflation fall too low. That message matters." Now, if we only knew WHAT the message was… As of this morning, it is once again a case of the Jedi versus the Empire. Let the lightsabers clash. We will hang out with the Ewoks.